Historic Folsom will have tons of beautiful Crafts and Goodies for sale along the 600-900 block this Sunday. Be sure to be early due to street closures. The Parking Garage will be open, and if you show the Spring Arts and Craft Fair postcard you can get FREE round-trip transportation via Light Rail. Join us in our Family Room for a FAMILY FRIENDLY EVENT! 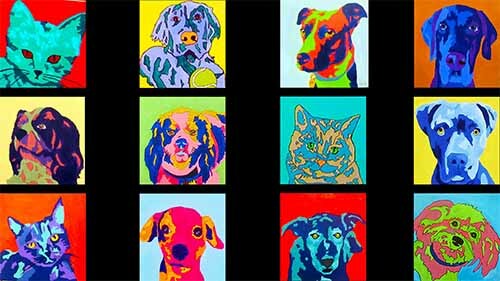 Paint Your Pet ~ WARHOL STYLE! The iconic and renown Artist Andy Warhol is a Pop Art legend. He created mass production of images printed and painted over and over again in bold colors. He used Marilyn Monroe as one of his most popular mass production subjects and he colored her image every color imaginable. 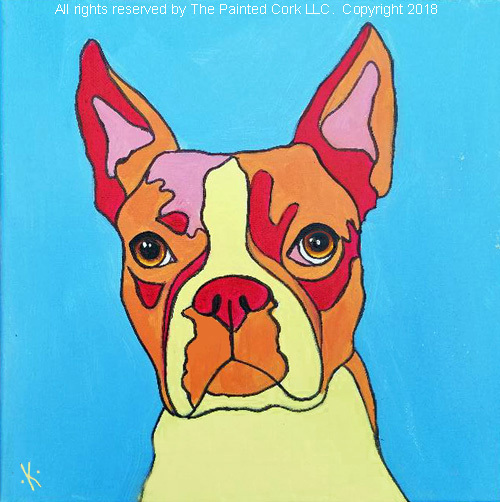 This class is a colorful twist on our "classic" version of Paint Your Pet which is more realistic in construction and color. In this class we will concentrate on all colors of the rainbow and channel our inner Warhol! Simply send us via email (at ) a high resolution HEAD SHOT photograph of your pet (full body pics will be cropped to a head shot) that has clarity and good lighting and we will hand sketch the image of your pet onto a 12 x 12" stretched canvas for you prior to the class! During the class, we will guide you through the step by step process of creating a colorul painted portrait of your pet! Please do know that the better the photograph, the better your drawing and painting will be! Background elements in your original photo will be eliminated all together. THIS CLASS IS FOR ONLY ONE PET. We will have an 8 x 10 picture of your pet for you to paint from. After reserving your seat online, send your image as soon as possible via email to with YOUR NAME and CLASS DATE. Please send your photo at least 6 days in advance. Paint Your Pet is a non-refundable class.